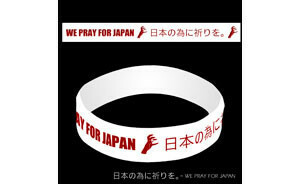 The 'Born This Way' singer urged her twitter followers to buy the $5 red and white accessory - which reads "We pray for Japan" in both English and Japanese - before telling her fans, whom she refers to as her 'Monsters', that they have already accumulated the large sum. She tweeted: "Monsters: in just 48 hrs you've raised a quarter of a million dollars for Japan Relief. It's important we help. X (sic)"
The Asian country has suffered widespread devastation to its north eastern island as a result of the 9.0 magnitude earthquake and after affects on Friday, and Gaga has been among many stars to come forward on the social networking website to help raise donations. Singer Katy Perry tweeted: "Remember as you go about your day please #prayforjapan & if you are able, text REDCROSS to 90999 to donate $10 to Japan's emergency relief. (sic)"
Teen heartthrob Justin Bieber also sent a message to fans, writing: "Japan is one of my favourite places on earth - it's an incredible culture with amazing people. My prayers go out to them. We all need to help." People can donate to the relief fund via The Red Cross through a variety of methods including the charity's website, Facebook and iTunes.